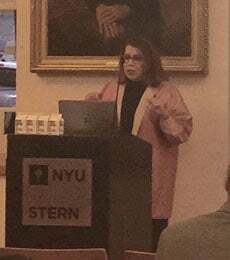 NYU Stern’s Salomon Center and The Clearing House welcomed Carmen M. Reinhart, Minos A. Zombanakis Professor of International Financial System of Harvard Kennedy School for the Gallatin Lecture Series on Banking. In her talk, Reinhart shared some of the key indicators that a financial crisis may be coming, including a surge in public and/or private debt. She shared insights from her joint research on 100 crises from the mid-1800s to present across different countries. Pointing to data on the average recovery time for crises today compared to the 1800s, Reinhart identified the factors that have made the current financial crisis so protracted. She presented data on financial crises across Europe, focusing on balance-of-payments and banking issues in Greece and highlighted the connection between financial crashes and debt problems. Reinhart concluded with takeaways from her research, noting the re-emergence of financial repression, or measures taken by governments to rein in their debts. The Gallatin Lecture Series on Banking is inspired by Albert Gallatin (1761-1849). Throughout his long and distinguished political career, Gallatin was intimately involved with the financial and banking issues of his time. As Secretary of the Treasury he proposed the establishment of a consortium of private banks, which idea ultimately became The Clearing House. Then, after settling in New York, he helped found New York University.